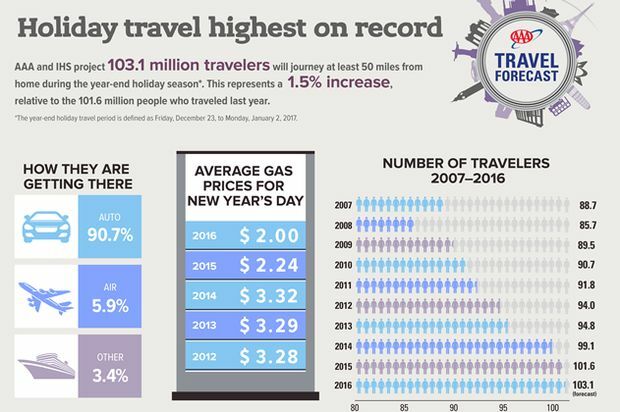 More than 103 million Americans—the most on record—are expected to travel for the year-end holidays, according to AAA Hawaii. This represents a 1.5 percent increase, or 1.5 million more people traveling, compared with last year. This comes despite one fewer travel day this holiday season. The year-end holiday travel period is defined as Friday, December 23 to Monday, January 2, 2017. AAA estimates U.S. drivers have saved more than $27 billion at the gas pumps so far this year compared to the same period last year. Today’s national average price for a gallon of gasoline is $2.22, 22 cents more than the average price on New Year’s Day 2016 ($2.00). Hawaii's average gas price is currently $2.93, 19 cents higher than this time last year and 25 cents higher than the $2.68 average on Jan. 1. AAA expects to rescue more than 980,000 motorists over the 11-day holiday travel period, with the primary reasons being dead batteries, flat tires and lockouts. Drivers should have their vehicles inspected by a trusted repair shop, such as one of the nearly 7,000 AAA Approved Auto Repair facilities across North America. Members can download the AAA Mobile app, visit AAA.com or call 1-800-AAA-HELP to request roadside assistance. Before setting out on a holiday trip, travelers should download the free AAA Mobile app for iPhone, iPad and Android. The app can help map a route, find lowest gas prices, access exclusive member discounts, make travel arrangements, request AAA roadside assistance, find AAA Approved Auto Repair facilities and more. Learn more at AAA.com/mobile.